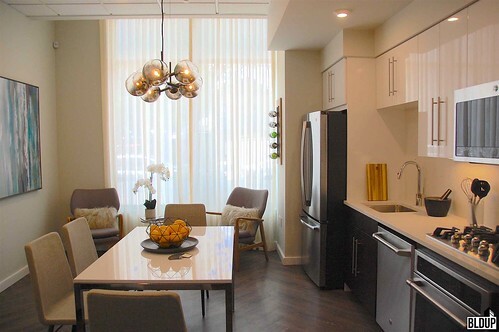 A Certificate of Occupancy has been issued for floors 1-4 of the Treadmark in Dorchester. 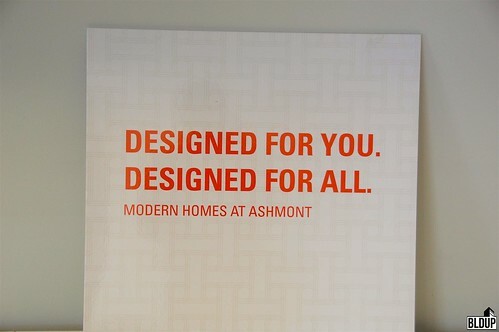 This certificate covers 51 of the 83 residential units. 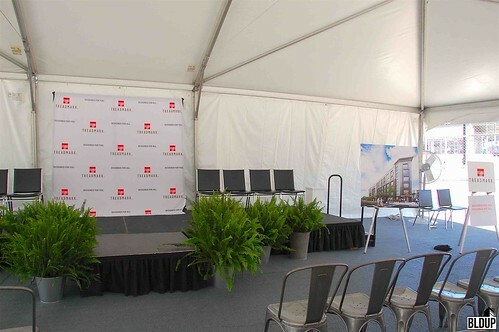 This project also includes around 5,000 sq. 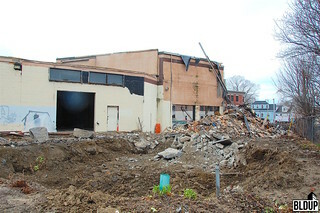 ft. of ground floor retail and parking for 30 cars. 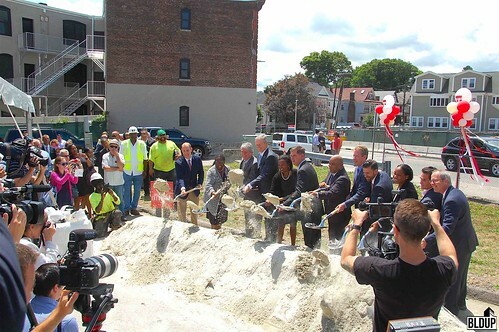 Completion of the project is a long time coming after a notorious fire destroyed the under-construction building in summer 2017. 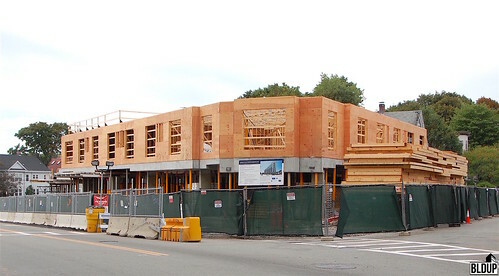 Interior finishing is underway for the 83 residential units coming to Dorchester Avenue across from Ashmont Station. 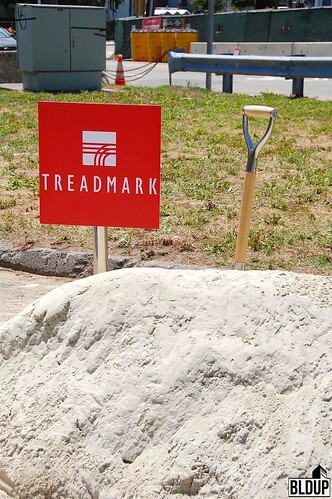 Treadmark 2.0 is expected to open in November 2018 after a fire destroyed the project last summer prior to initial opening. 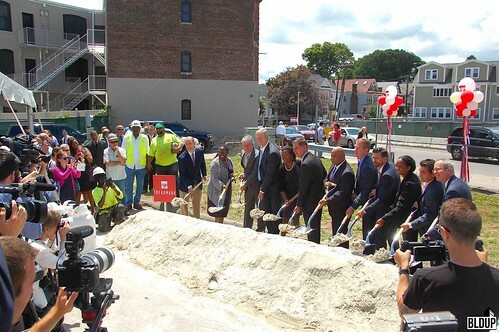 Of the 83 units, 51 are designated as affordable rentals and 32 will be condos. 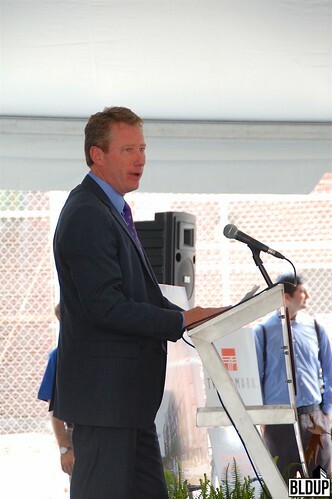 The ground floor of the project will include a 5,000 sf commercial space to feature specialty food market, American Provisions. 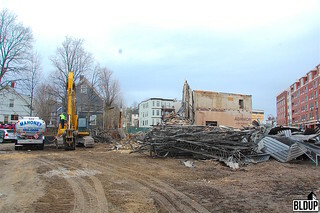 The Treadmark in Dorchester has once again reached its full height of six stories after a fire last year forced the demolition of most of the original wood framing. Exterior work now continues on the 83 unit project. 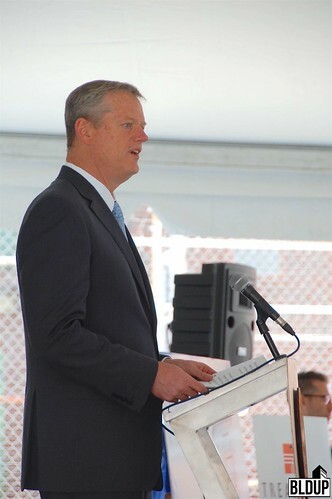 Directly across from the Ashmont, MBTA Station, the development will include a common roof deck, underground parking, and around 5,000 square-feet of ground floor retail. 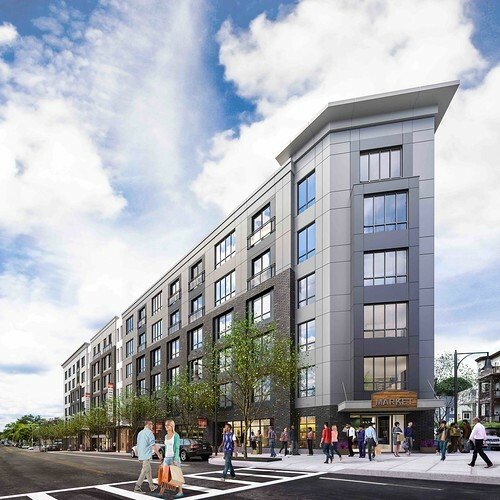 South Boston specialty food retailer American Provisions has received official approval to construct a new retail location at Dorchester’s new Treadmark mixed-use development across from Ashmont Station. The new 2,500 square foot American Provisions store will open in Summer 2017 and will feature 1,500 retail square feet with a 1,000 square foot kitchen. 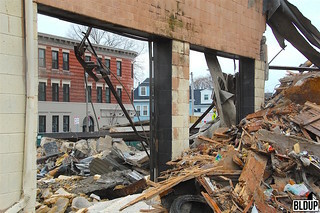 American Provisions is now seeking a license to sell beer and wine at the new store. 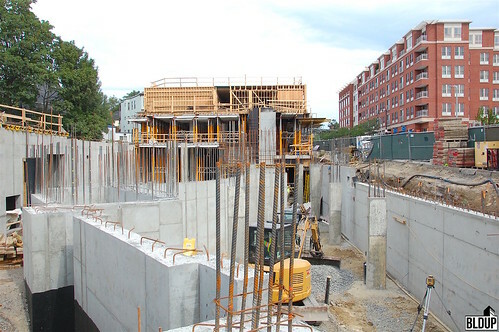 Treadmark's concrete foundation is fully framed, and a large concrete section of the building's ground level has been poured. 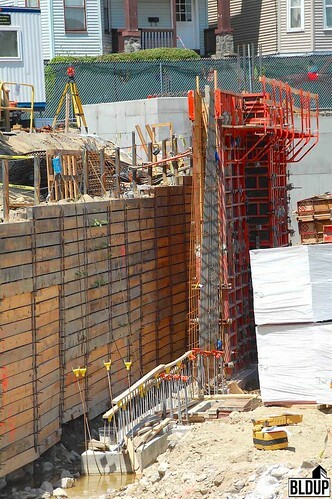 A PERI Skydeck system is being used to frame the concrete pour and support the poured slabs as concrete hardens. 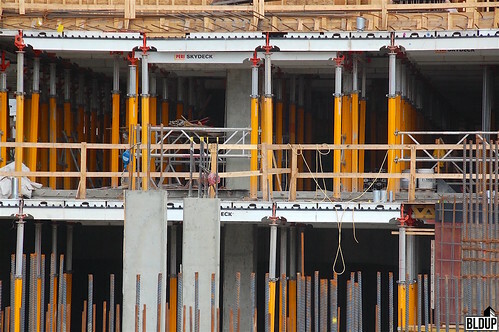 Wood framing of levels two through six has begun above the concrete base, with a large section of level two fully framed and level three framing rising. 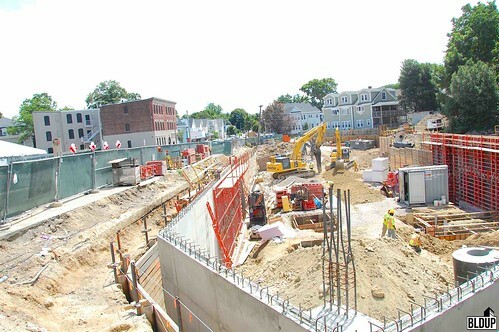 Located in Dorchester's Ashmont neighborhood across from the Ashmont MBTA station, Treadmark will span a full block along Dorchester Avenue between Fuller Street and Mercier Avenue. 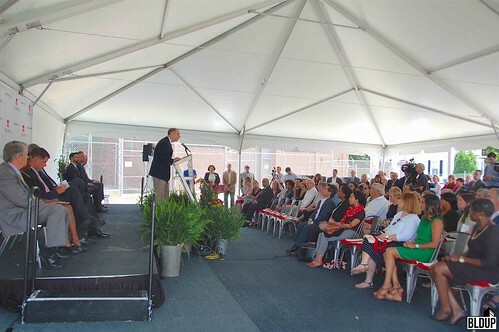 We had the honor and privilege of attending the official Treadmark groundbreaking ceremony this past Monday, July 11th. 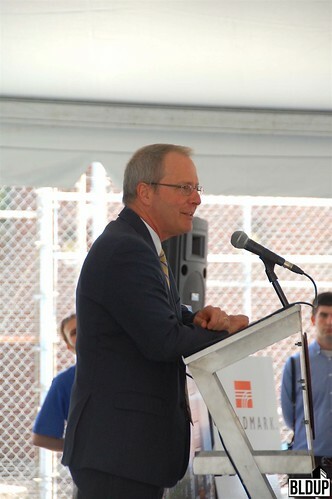 We would like to extend huge congratulations and thanks to Trinity Financial on this important milestone. 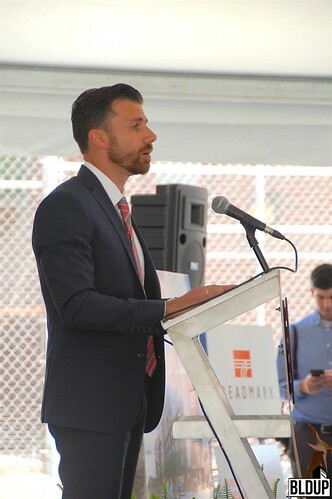 Treadmark will further enliven the Ashmont neighborhood of Dorchester with 83 new residential units, including 51 new affordable rental units and 32 ownership condominiums, as well as approximately 5,000 square feet of ground-floor retail space. 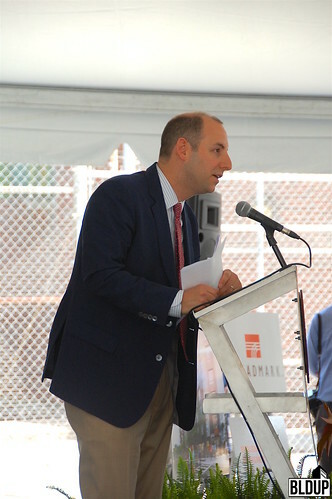 Treadmark's anchor retail tenant will be American Provisions, a South Boston-based specialty food retailer. 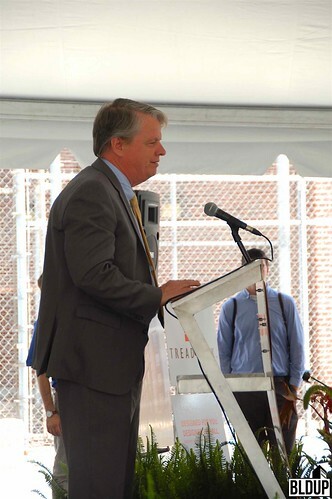 The following is a link to the official press release announcing Treadmark's groundbreaking. 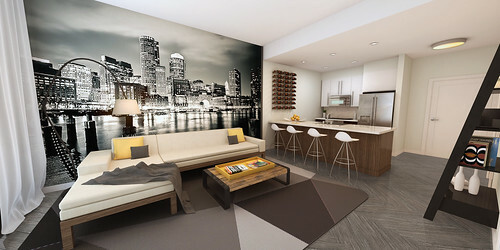 The following are the latest renderings of Treadmark, formerly known as Ashmont Transit-Oriented Development (TOD) 2. 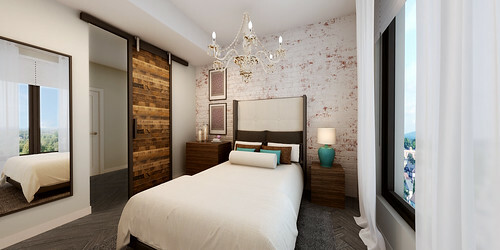 Treadmark's architect is The Architectural Team, and the building's interior designer is Taniya Nayak Design. Exterior rendering is by Neoscape. 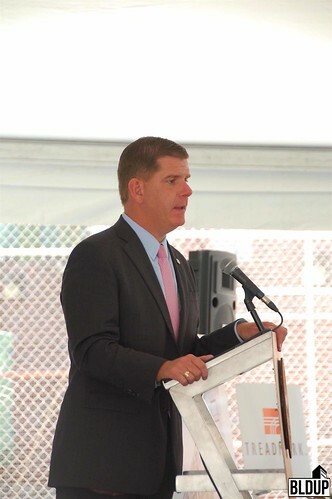 Speakers at the Treadmark groundbreaking ceremony included Trinity Financial Senior Project Manager Mathieu Zahler, Massachusetts Governor Charlie Baker, Boston Mayor Marty Walsh, Massachusetts Senator Linda Dorcera Forry, RBC Capital Markets Managing Director Craig Wagner, Massachusetts Housing Investment Corporation President and CEO Joe Flatley, Boston Private Senior Vice President Peter Hollands and Greater Ashmont Main Street Board President Philippe Saad. 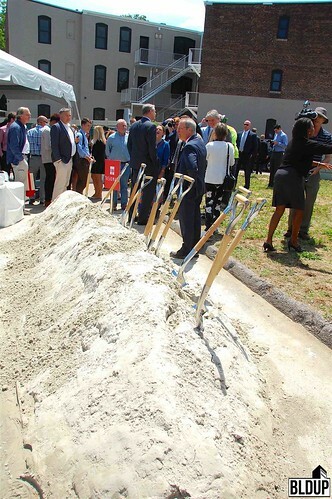 Speeches were followed by a ceremonial groundbreaking on the construction site and a celebratory reception at Tavolo Risorante in Trinity Financial’s neighboring Carruth transit-oriented building. 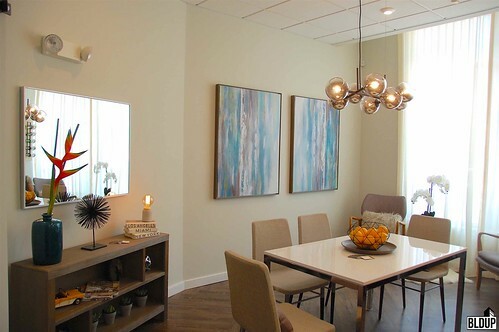 The sales center for Treadmark’s 32 market-rate condominiums is now open in the Carruth building, and condominium pre-sales have begun. 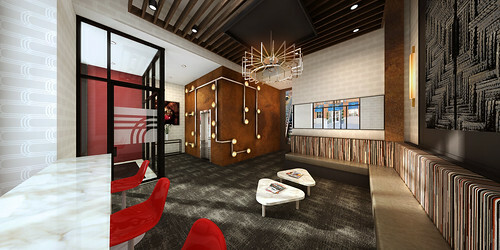 Visit LiveTreadmark.com for more information. 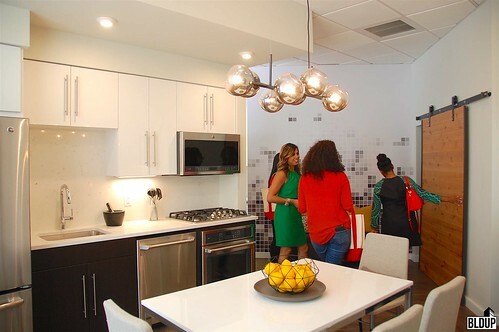 A model unit has been installed at the sales center. 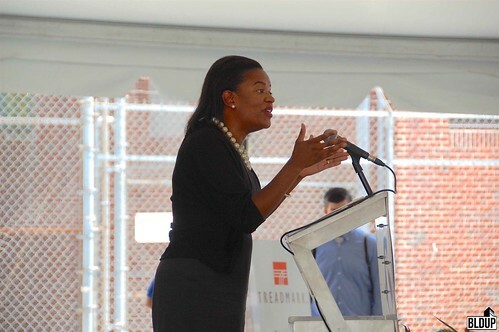 After the ceremonial groundbreaking, Treadmark interior designer Taniya Nayak gave a tour of the model unit and finishes. 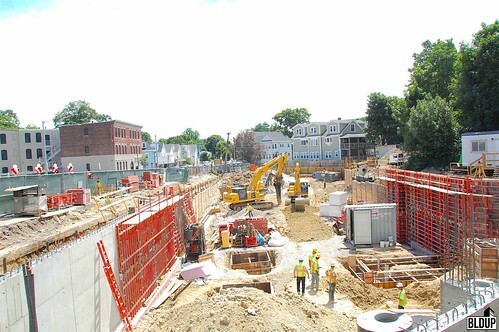 Construction of Treadmark’s foundation is well underway, with concrete poured along a large vertical section fronting Fuller Street. 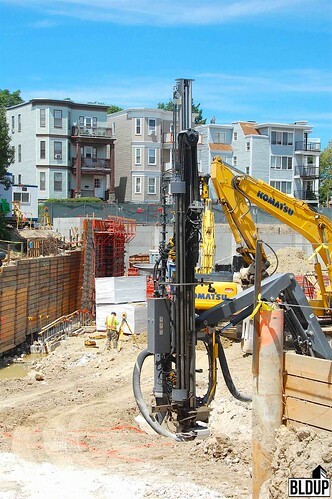 At the Mercier Avenue end, a FlexiROC T40 tophammer drill rig is being used to assist with foundation excavation by breaking rock. 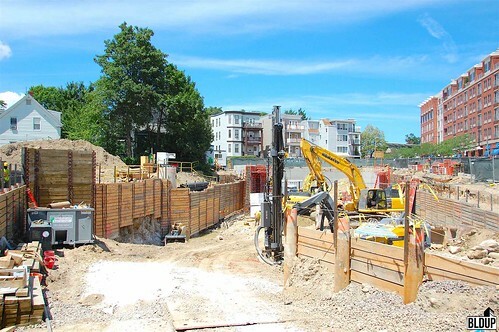 A sheet pile wall is built along the building’s entire perimeter, and wooden shoring is installed to reinforce Treadmark’s foundation during construction. 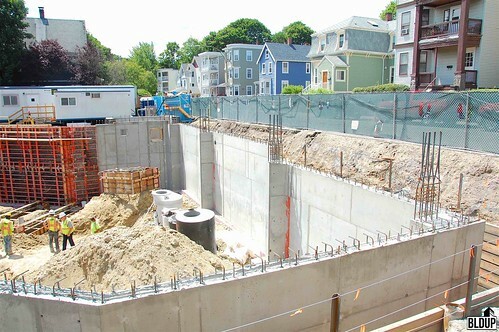 Steel and wood forms are being set up along the foundation’s base for concrete pouring. More information about Treadmark is posted below. 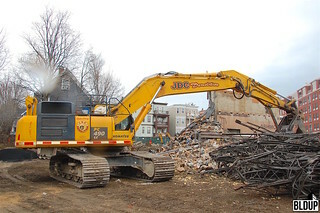 J. Derenzo Companies' JDC Demolition division is hard at work demolishing the former Ashmont Tire building to make way for the Ashmont TOD2 mixed-use development. 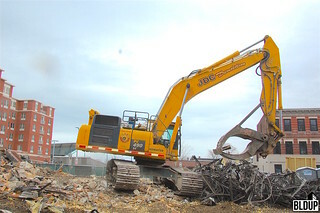 LM Heavy Civil Construction has also begun digging up existing utilities on site. 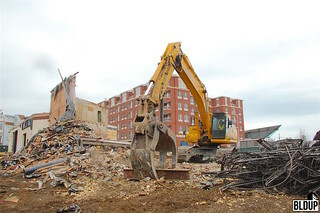 Cranshaw Construction is the project's general contractor. 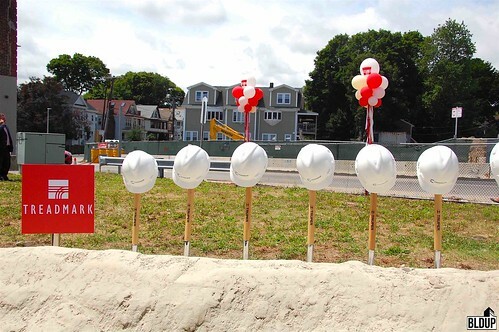 The Ashmont TOD2 team secured financing for the project earlier this year, as reported by The Dorchester Reporter. 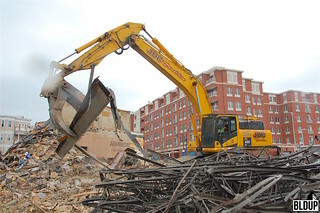 The team hopes to open the building to residents in 2017. 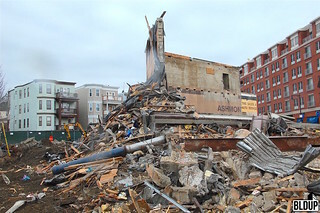 On March 10th, 2015, Ashmont TOD2 was approved by the City of Boston's Zoning Board of Appeals. 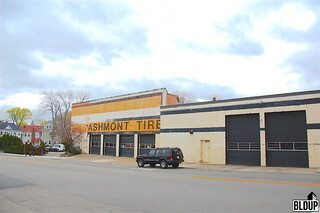 Ashmont TOD2 was approved by the Boston Redevelopment Authority on February 26th, 2015 and will be built on the site of the existing Ashmont Tire facility. 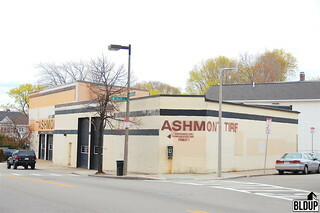 Ashmont Tire is located across Dorchester Avenue from the Ashmont MBTA Red Line station in Dorchester's Ashmont neighborhood. 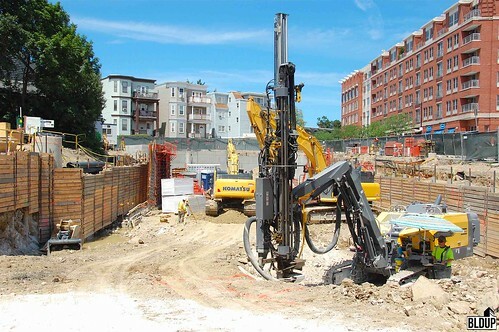 Having received all necessary approvals, Ashmont TOD2 is now ready to move forward with construction.